Our product range includes a wide range of centrifugal thermic fluid pumps. Our firm is counted among distinguished organizations involved in offering Centrifugal Thermic Fluid Pumps. 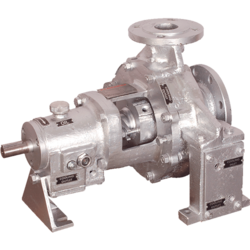 These pumps are equipped with water / self cooling feature that makes them suitable for the applications in heat transfer plants and handling of organic heat transferring of oils. In compliance with the latest industry standards, these pumps are designed with heavy duty bearings. - RO & DM Water Plants Thermic Fluid Circulation. - Stainless Steel as per ASTM A 351/743 Gr. CF8, CF8M. - Carbon Steel / WCB. Looking for High Temperature Thermic Fluid Pumps ?